BENGALURU: The Kasturinagar bus stop and the Shanthi Sagar eatery nearby have been the hubs for discussion and brainstorming of the Kasturinagar Rising and members of the local RWA for quite some time now. Visit these places at any point of time in the afternoon and you will find Ravi Kiran N and Murugan Munirathnam talking away about what spot fixes to take up next. At other times one would find them, getting some word advice from some seniors of the locality like Thangaraj J, a retired manger with a government firm. “I am glad that the new generation is taking up the mantle from us and are taking care of the locality. 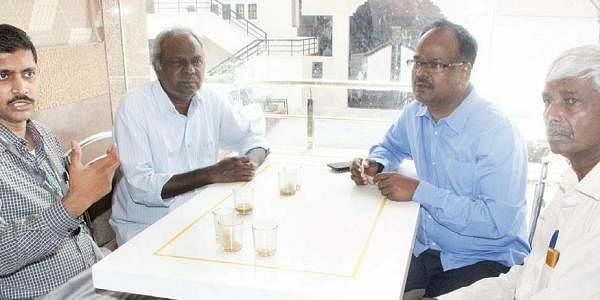 My house in Bennaganahalli was one of the first to come up here and I have seen some major changes around here,” he says. Another old timer in the locality, G Ganesh who worked with another government firm is also a regular part of the ‘bus-stop’ meetings of the group. Ravi is a former entrepreneur who has been a resident of the area since 1998. In fact it was he who organized the first ever spot fix under the Kasturinagar Rising group back when it was not even known by that name in 2015. “There was this black spot of garbage near my home. I just posted on Facebook about the spot fix in 2015 and the work was done,” he says. Getting a taste of this first community led cleanup, Ravi was spurred to take more such initiatives and was joined by other like minded individuals like Murugan who has been in the locality since 2001. A businessman, he was earlier in commercial street where he organised health camps and activities for residents there. Another main member of the group is Venugopal, who is a director at the local RWA.